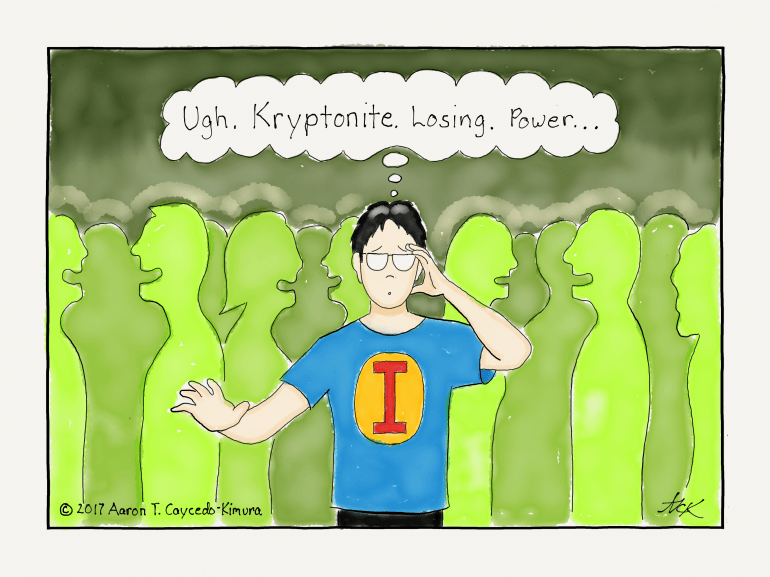 Just as the green glowing rock of the planet Krypton drains Superman of his super powers, so the large social gathering empties introverts of our energy, even if it’s a party of good friends. Big social occasions involve lots of people, noise, movement, and interaction. We’re just not wired to handle so much outside stimulation. While some introverts avoid large groups at all cost, others may actually like to be a part of them once in a while. I’m somewhere in between. I’m a huge introvert, so they’re never my setting of choice (I prefer smaller get-togethers with two to five people), but I go when I have to. So, how do you survive a large social gathering? Here are four steps, with illustrations from my book Text, Don’t Call. 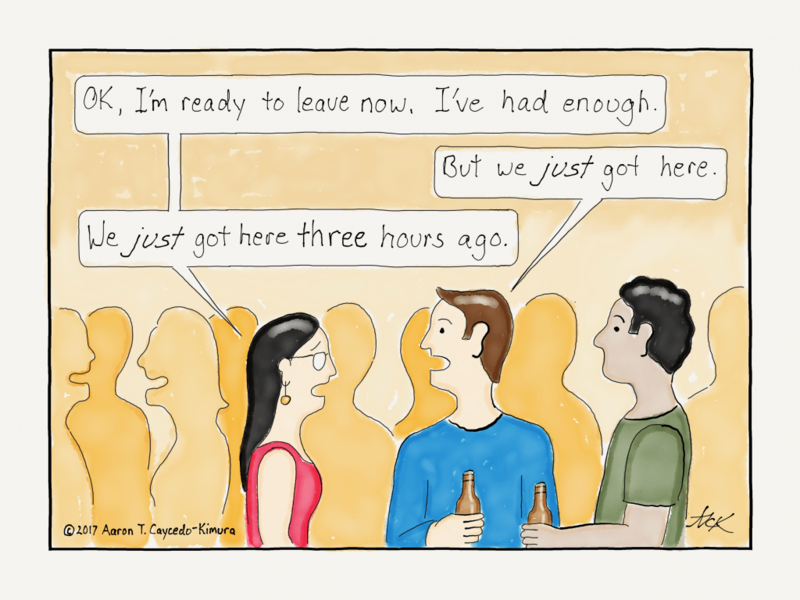 First, it’s important to keep in mind that socializing isn’t only about the event itself. It’s a complete mental and emotional experience that encompasses the anticipation before, the actual gathering, and the unwinding after. While this can all be energy-giving for an extrovert, for an introvert, each of these stages can represent a challenge. 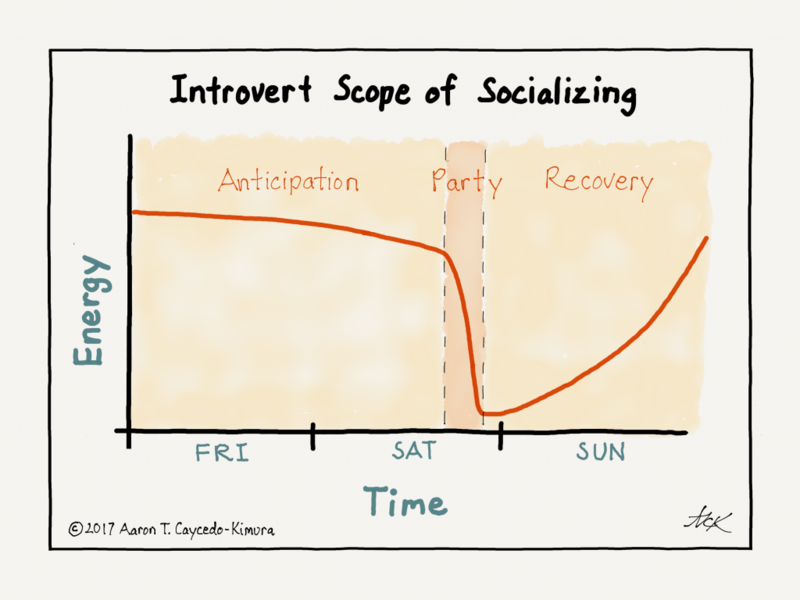 Depending on your degree of introversion and the intensity of the situation, a social experience could involve days, not just the two or three hours spent mingling. Before the gathering, prepare yourself. Make sure you get a good night’s sleep or at least rest up for a few hours before. That way your batteries will be sufficiently charged. Everything is harder when you’re tired. Gathering information about the event as far in advance as possible can help make you feel more relaxed and ease the possible tension of anticipation –things like where it is, what the start and end times are, and who’s going to be there. Being the foodie I am, I always like to know what kind of refreshments are being served. It really helps to have something to look forward to! Also, plan your escape. Make sure you’ll be able to leave when you need to. This may mean driving your own car or making an agreement with a friend who’s willing to leave when you’ve had enough. When I first arrive, I find it helpful to scope out the lay of the land. This has become almost second nature to me. I note the locations of the restrooms and exits (in case I need a short break later on), and, of course, the food. I also check out who’s in the room. 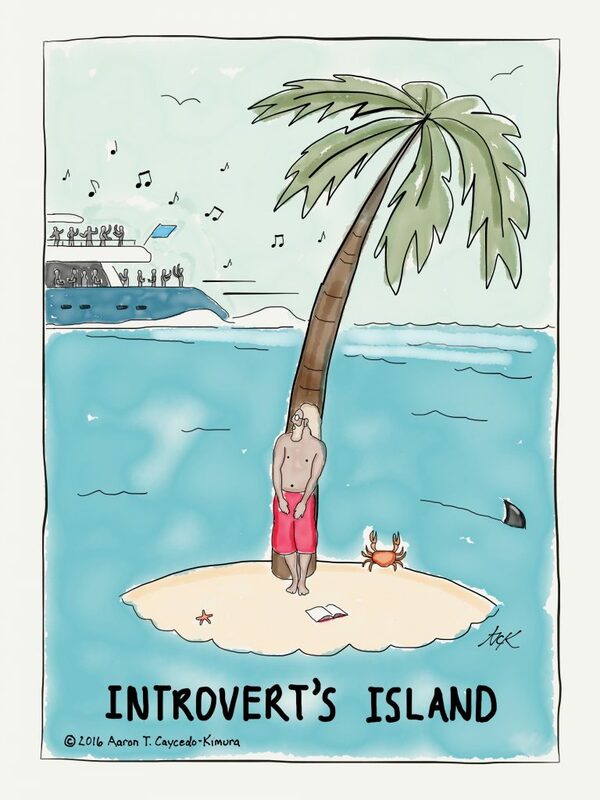 I’m mainly searching out other introverts. Although I’ve had great conversations with extroverts, I’m more comfortable with others who are generally quieter and prefer one-on-one interaction. This reconnaissance can initially help put you at ease. If you start feeling a bit overwhelmed, try finding a quiet corner to retreat to or step outside for some fresh air. Another strategy is to spend your time behind the scenes, helping the host serve or clean up. This reduces mingling time. Speaking of mingling, there’s always going to be a certain amount of small talk you will have to do. As much as we introverts dislike small talk, remember that it can always lead to deeper conversations if you ask the right questions. And when you begin to experience the warning signs of your battery icon hitting red — your eyes glaze over, you’re not really hearing what people are saying, everything around you becomes a wash of white noise, you start feeling antsy and tired at the same time — it’s best to excuse yourself and leave. After the gathering, even if you had a great time, expect some fallout. It’s likely that you’ll experience some difficulty unwinding when you get home. Shut yourself off in solitude. 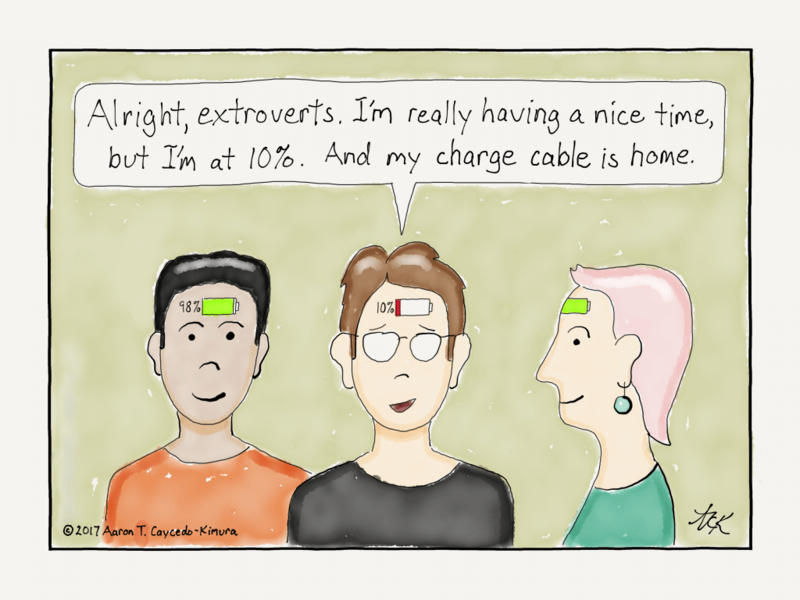 If your significant other is an extrovert, you may have to politely explain that you need quiet. The party’s technically over, but for you, it rages on in your mind — all the interactions you had, all the noise, and all the images. Try relaxing in a tub with a soothing beverage and a good book to focus your mind on something else. When accepting an invitation to a large gathering and marking my calendar, I usually cross out the day after as well. I know I’ll be peopled out with an introvert hangover. 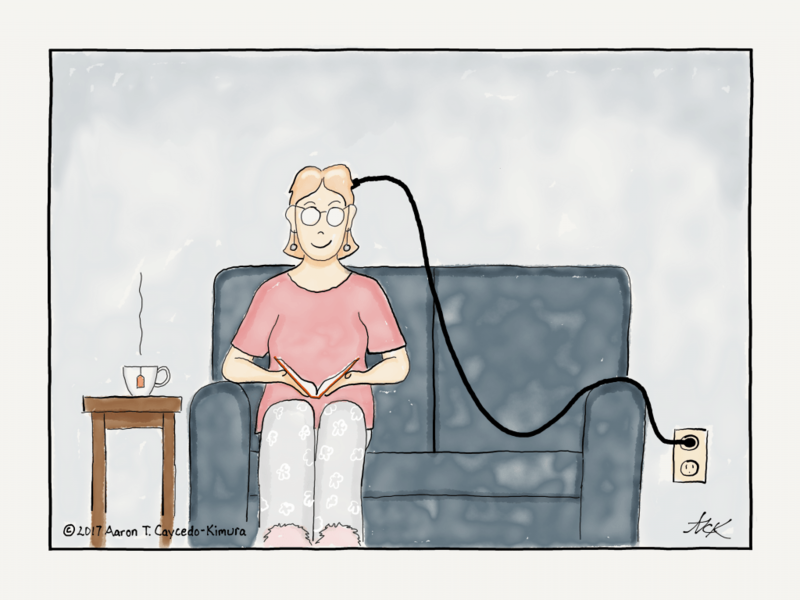 The only remedy for that is quiet time alone to recharge. A version of this post was originally published on Signature. It’s republished here with permission from the author.